Since its establishment, ICS has experienced steady growth and financial stability, enabling the company substantial bonding ability. Employee loyalty has been strong, as evidenced by several key employees who have been with the organization for over 22 years. 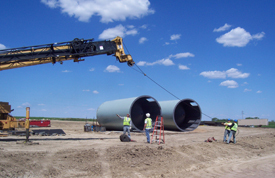 Our mission is to exceed the expectations of our clients on every project while maintaining the safety, integrity, and economic security of our valued employees and company. As a successful general contractor and systems integrator, we have the ability to provide a fair, cooperative, and timely problem-solving approach to achieve a solution when the unforeseen happens. Our goal is to win your trust and develop a solid relationship that carries into the future.